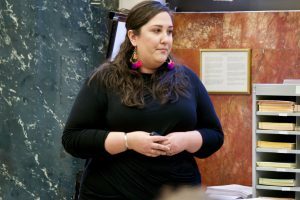 On April 9, 2019, as part of National Crime Victims’ Rights Week, the Multnomah County District Attorney’s Office hosted a crime victims’ rights training for attorneys and non-attorneys. A crime victim’s legal rights are guaranteed by the Oregon Constitution and Oregon Revised Statutes. Senior Staff Attorney Yazmin Wadia with the Oregon Crime Victims Law Center presented the training. “Crime victims have a voice and in this noisy and chaotic system, they must always be heard and supported,” Wadia said. Wadia added that in general, Oregon law requires victims be notified, present, informed, heard and consulted with during critical stages of a criminal case, such as a release hearing, change of plea and sentencing. Some victims’ rights are automatic while others require that the crime victim request them within a certain time. Using the Multnomah County District Attorney’s Witness Intimidation Support Program, the Victim Assistance Program provides safety planning, advocacy and financial assistance to victims, witnesses and their families, who are facing intimidation or who are endangered due to their ongoing or anticipated testimony in a criminal case or investigation. In 2018, the victim advocates represented and assisted more than 4,700 separate individuals navigate the criminal justice system. “Recovering from trauma and processing what has happened to you or a loved one can be a lifelong process. It’s important to have support and information as early as possible,” said Emily Hyde, program supervisor of the Multnomah County District Attorney’s Victim Assistance Program. When an individual is identified as a crime victim, the Multnomah County District Attorney’s Office will provide that person with information about their rights as a victim, the opportunity to submit information about their losses for restitution and frequent updates on the case. The victim advocate along with the assigned case deputy district attorney, are responsible for ensuring that the victim has been advised of their rights and that when the victim requests, those rights are afforded to the them. Victim advocates will attend court appearances with or on behalf of the crime victim and offer referral information to appropriate community services. On average an approximate 30,000 victims’ rights notifications are made by the Multnomah County District Attorney’s Office each year. The Victim Assistance Program provides comprehensive victim services and programs to ensure all individuals are treated equitably. 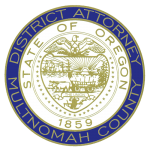 The Multnomah County District Attorney’s Office has a victim advocate assigned to the Gateway Center for Domestic Violence Services in Northeast Portland where the office can provide consultation and help to community members so they understand the court process. More than 3,000 individual participants access services from the Gateway Center each year. Every participant is offered services upon arrival. Our victim advocate is available to work collaboratively with on-site partners to provide information and assist victims of domestic violence and elder abuse. The advocate is a subject matter expert in domestic violence and is able to assist with the reporting process, having a case reviewed for prosecution, safety planning and appropriate referrals. Immigrant people who are victimized by crime face unique challenges in accessing—or even trusting—our criminal justice system. As such, the District Attorney’s Office is a participant of the Immigrant Crime Victims’ Rights Committee, which includes immigration law attorneys, immigrant peoples’ advocacy groups, such as Immigrant and Refugee Community Organization (IRCO), local law enforcement agencies, and the Oregon Attorney General’s Office. The committee members meet regularly to solve problems of accessing the criminal justice system for immigrant people, both documented and not. This outreach and inclusion is critically important given the rhetoric coming out of Washington D.C. The Multnomah County District Attorney’s Office recognizes the importance of the U visa certification process to our community. The U visa allows eligible victims to temporarily remain and work in the United States, generally for four years. While in U visa nonimmigrant status, the victim has an ongoing duty to cooperate with law enforcement and cannot unreasonably refuse to assist with the investigation or prosecution of the criminal activity. If certain conditions are met, an individual with a U visa may apply for adjustment to lawful permanent residency status, such as seeking a green card in the United States after three years. The District Attorney’s Office is also part of the Multnomah County Victim Assistance Mass Casualty planning committee, the Sexual Assault Response Team, the Sexual Assault Victim Advocate Program, and the Untested Sexual Assault Kit Project. To receive more information on the Victim Assistance Program, call 503.988.3222. To download the Victims’ Rights Guide click here.